Arval is repositioning itself as a mobility solutions company with a plethora of new services, some aimed at non-company car driving members of staff. 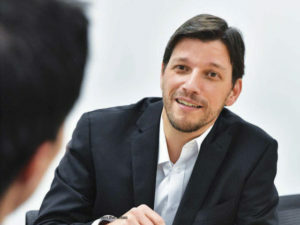 UK managing director Miguel Cabaça talks to Curtis Hutchinson. Arval is changing. Already Europe’s biggest leasing company, the business has embarked on an ambitious expansion plan which will see it grow its global fleet from 1.1 to 1.3 million units by the end of 2020 as it rolls out a plethora of new services aimed at growing its current business and expanding into the consumer marketplace. Arval has undergone significant growth in the UK following the acquisition of GE Capital in 2015. Last year its UK fleet totalled 161,418 vehicles, slightly down on 2016, but double what it was before the acquisition. It is the third biggest global market for Arval behind its native France and Italy, where it has expanded significantly through trialling its ambitious B2C propositions. Having invested heavily in its IT infrastructure, a process encouraged by Bismut who started his career in data processing management, the company now operates a single IT platform across its international operations, simplifying both its internal and customer-facing systems. It also means if an initiative is piloted in one market, it can be introduced to others with minimal fuss. The new IT platform also enables the company to further manage, develop and build its Arval Active Link offering as part of its plan to have every vehicle on its fleet equipped with telematics. Every new car introduced to the Arval fleet since 2015 has been equipped with telematics, which equates to 100,000 subscribers. The aim is to have the whole fleet covered by 2020. For Miguel Cabaça, who was appointed as managing director of Arval UK last November, the new direction is a way to continue to re-engage with existing customers and attract new ones. At the heart of its new B2C solution is the rollout of services to staff within existing client companies; employees who do not qualify for a company car but still need a vehicle for private and business usage. There’s also an ambitious car sharing programme whereby the traditional pool car model is turned on its head (see panel) with the assurance of better utilisation and accountability. Cabaça believes the groundwork already done in B2C will enable the UK operations to grow rapidly. Typically HR departments within client companies will be able to introduce finance and mobility solutions to non-company car drivers, giving employers a powerful tool to win and retain staff. Long-term, Arval sees its services appealing to a wider audience outside of its current client base. Cabaça’s confidence is based on Arval delivering a suite of products that will resonate with companies wanting to offer competitive employment packages but have struggled to find suitable mobility solutions in one place. He also admits that buy-in from HR departments, as well as fleet managers, will be pivotal. “These are not standard products and probably touch HR more [than fleet managers] because of their added value. This is different from the traditional company car concept and the way it is communicated. It’s our job to make sure it is well communicated and simple to understand. What is clear from Arval’s raft of new products and services is that these will act as a springboard with the business constantly testing and assessing services and opportunities across its 29 global territories as it considers further mobility solutions to roll out. The end of the pool car? Arval Car Sharing is the company’s answer to an age-old conundrum: how do you get the best utilisation out of a pool car? The Arval solution, based on a vehicle leased for 12 months, is made available for staff to use for business, with an option to pay for private usage. Working from the Arval Active Link telematics platform, eligible staff can use a mobile app, or web portal, to book a vehicle for a required period, ranging from hours to days. The app can also be used to access, start and lock the car. The telematics monitor usage and manages the expenses process. Alternatively, existing pool cars car be retro-fitted to include the telematics. Cabaça is also looking at an emergent trend in France where some employees are starting to hire out their private cars to colleagues for short periods: “Everything is possible technically, and we need to be in there with a solution. We will take small steps maybe providing one company with a solution and then roll out out from there,” he says. Arval For Me is new to the UK and launches in the second half of 2018. It provides individuals access to Arval’s established network covering repair and maintenance, relief cars, pick-up and drop off. Arval Car Sharing is also new to the UK and offers a digital-based alternative to traditional pool cars with wider access to employees for both private and business usage. Arval For Employee is already available but is being extended to include Arval For Me and Arval Car Sharing. My Arval goes live from April and provides fleet managers and drivers with a new app-based platform for data and services. Electric Vehicle is an extension of Arval’s existing leasing options on EVs based on a new partnership with Renault and Nissan for the vehicles and NewMotion, the infrastructure provider, to offer charging points at home and work.